If there’s one thing I have wanted to see more of in the nevertheless always very worthy free anthology Off Life in its short life to date then it’s been a greater emphasis on work from emerging creators. It’s a point I touched on when I reviewed Off Life #10 here in ‘Small Pressganged’ last year though, admittedly, given the remit I’ve set for this column in focusing first and foremost on championing up-and-coming creative voices I’m hardly impartial when it comes to pushing deserving new practitioners towards a greater audience. I was delighted, then, to see such a prominent focus on a number of relatively newer names I’ve flagged up at Broken Frontier over the last year or so in Off Life #11. 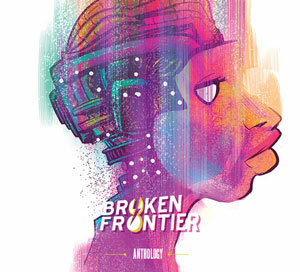 Indeed the entire edition’s contents are by artists making their first appearance within Off Life’s pages. An excellent example of this can be seen in the issue’s opening story ‘War on Magic’ (sample above) by Darren Cullen whose wittily scathing work I’ve covered at BF in reviews of his self-published comics Join the Army and Below. While I’ve read this two-pager online in the past it’s a perfect example of Cullen’s bitingly intelligent satire, detailing how events spiral out of control when David Copperfield makes the Twin Towers disappear and George W Bush declares a war on magic. Cullen, as ever, is uncompromising in delivery, underlining his distinctly cutting approach to his subject matter. Brigid Deacon is another creator whose work I discovered only recently but whose oblique narratives and unconventional style of panel-to-panel storytelling has intrigued me in books like Coma Deep from Eyeball Comix and the most recent issue of Donya Todd’s Bimba anthology. ‘Dream Manifesto’ – her ruminations on identity and self-image – is one of the standout offerings in Off Life #11. Pleasing also to see a spotlight on Grace Wilson’s comics in her two-pager on post office queues and potential shoplifting. A visually vibrant and animated slice-of-lifer that turns one isolated encounter into a fascinating array of unanswered questions for the audience to ponder on. Retrofit’s Box Brown’s one-pager ‘R.I.P.’ is a stark reflection on our mortality and the finality of death that plays with the properties of the individual frame to create a sense of futility and inevitability. 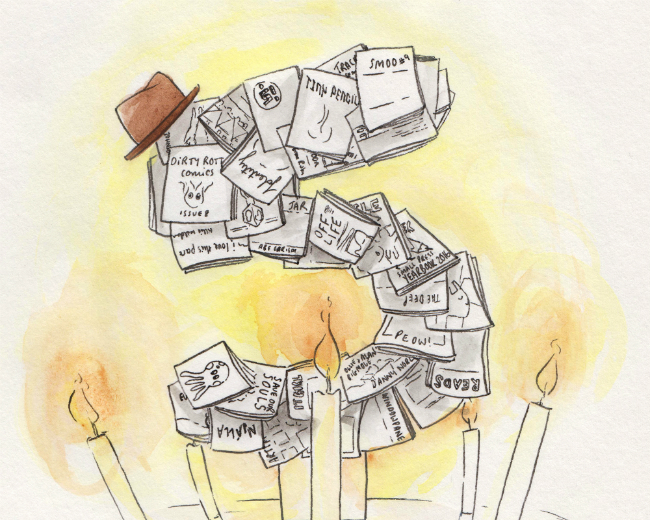 Alex Potts provides a similarly constructed comic strip meditation – though perhaps a little less profound – as he wrings out the drama inherent in a loss of facial hirsuteness in his typically Pottsian ‘Why oh Why Did I Shave Off My Beard?’. Quick mentions too for two other strips that have inspired me to investigate their creators further – Matthew Dooley’s droll ‘Olfactory Setting’ following the trials of a gent who can smell the emotions of others, and Kelsey Wroten’s beautifully pensive meditation on a past connection in ‘Earthlings’. 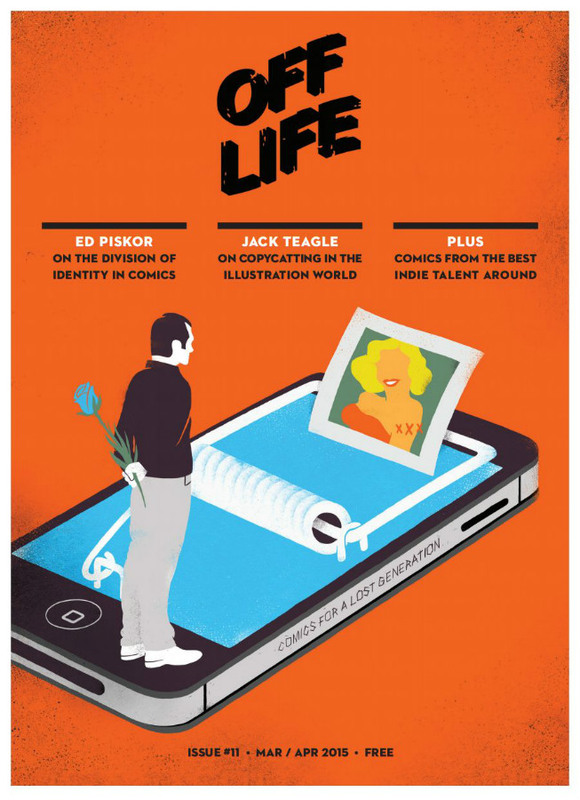 As ever, Off Life #11 is filled out with the usual interview features – this time Ed Piskor and Jack Teagle share their thoughts. 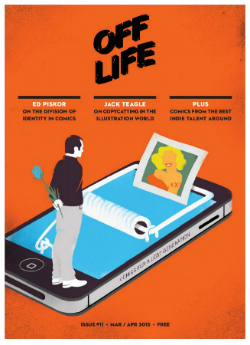 Off Life is distributed free in London and Bristol in print form but all issues to date including #10 can be read on the Off Life site for free. 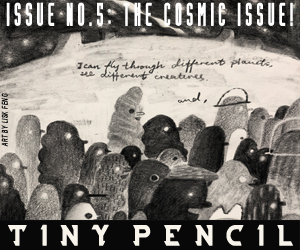 Celebrating 5 Years of ‘Small Pressganged’ at Broken Frontier – Creators and Publishers Pick Their Inspirational Artists!